Squamscott Vineyard & Winery is a small farm vineyard and winery located directly on the shores of the Squamscott River in Newfields, New Hampshire. The vineyard was started in 2012 with 28 vines and has grown to about 2500 vines - we are “the small guys”. We are growing cool climate, French hybrid varietals that do very well in the more moderate winters near Great Bay and the Gulf of Maine. The first handcrafted wine production will be from the 2017 harvest. Our focus is on providing seacoast area neighbors, small markets, and restaurants with local wines - while employing sustainable farming methods, maintaining open space along the pristine riverfront, providing educational opportunities for plant science and wine appreciation students, and offering unique local wines that are handcrafted from our vines using environmentally friendly and low-carbon footprint methods in the vineyard and in the winery. Our customers like to see where the grapes are growing, understand how the terroir affects the wine, and know the carbon foot print impact of the winery. Our wines are unique to most regions of New Hampshire; few vineyards can grow the cool climate varietals we offer. 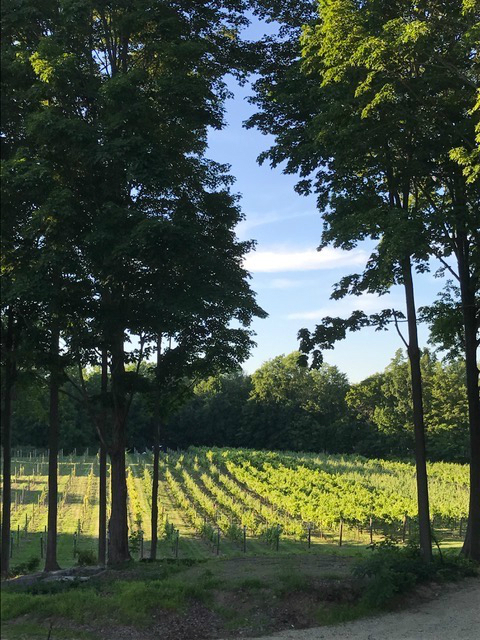 Our farm vineyard has a unique terroir - this special spot is on land that has been farmed for hundreds of years - by early settlers; and many hundreds of years before that by the Squamscott Native Americans - who were a part of the Algonquin tribes in the area. Our winemaking philosophy is to make the most natural wines possible - we believe that the less you do to the wine the more authentic expression of terroir you will get. We appreciate that the “wine is made in the vineyard” and we take extra care to hand harvest the cleanest fruit possible. Our Blue Heron Wines™ will have an “estate” product line that are 100% French hybrids from our vineyards. Co-Owners Bill Meserve the viticulturist, and Bob Elliott the winemaker have dug every hole, planted, pruned and nurtured every vine by hand; and then picked, crushed, fermented and bottled everything with family and friends. We are committed to preserving the small farm vineyard experience that will be focused on enjoying the vineyard’s natural setting, the art and science of postmodern winemaking, and the unique high quality wines produced and bottled in our winery. " farm store, Wines are also available at the Newfields Country Store.